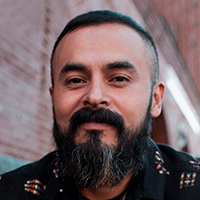 Fleeing a civil war-torn country in Central America brought Walter, WALO’s co-founder & executive creative director, to Dallas, Texas. Enamored with life in the U.S., he became a sponge for all cultures. Speaking Spanish at home and English in school with friends that were Latino, American, African-American, and Asian allowed him to develop a unique perspective of life. This perspective has molded his work and keeps it evolving. Over the last ten years, he has worked on brands like Fruit of the Loom, Comcast, Miller Lite, Samsung and Jarritos. With Lalo Durán, he opened WALO in 2014. In 2015 WALO became the AOR for Jarritos. Since then, WALO and Jarritos have created a strong and fruitful partnership. Before starting WALO, Walter worked for renowned agencies such as The Richards Group, Dieste, Grupo Gallegos and Lopez Negrete Communications.